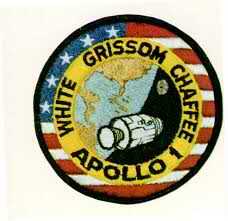 On March 21, 1966 NASA announced the crew of the Apollo program. Command Pilot “Gus” Grissom, Senior Pilot Ed White, and Pilot Roger Chaffee, was selected to fly the first manned mission with James McDivitt, David Scott and Rusty Schweikart serving as the backup crew. During a ground test on 27 January 1967 (a month before their scheduled launch), the crew died in a cabin fire that swept through their Apollo 1 spacecraft. The investigative Board issued its final report on April 5, 1967. The fire was probably caused by an electrical spark (no ignition source was ever found), and it grew out-of-control, fed by the spacecraft’s pure oxygen atmosphere maintained at greater-than-normal atmospheric pressure. 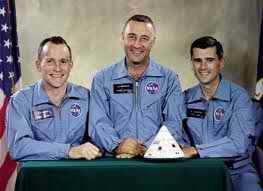 While all three astronauts had suffered third degree burns, the crew died of smoke inhalation. 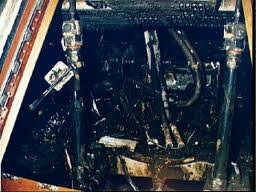 The board cited several specific factors that combined to cause the accident: (1) the cabin pressurized with pure oxygen provided an environment in which materials not normally considered highly flammable will burst into flame; (2) substandard wiring and plumbing in the craft; (3) flammable materials in the cabin (eg Velcro) had been installed throughout the spacecraft by the NASA crew; and (4) the flawed hatch design prevented the removal the inner hatch at high pressure, as with the fire. Deputy Administrator Seamans said that NASA’s single worst mistake in engineering judgement was not to run a fire test on the Command Module. All the flaws were corrected over the next twenty-two months before the first piloted flight could be made. President Lyndon Johnson who was a staunch supporter of NASA, supported the continuation of the space program to Congress portraying it as part of Kennedy’s legacy.